In the same way that the library uses the Dewey Decimal System to keep everything orderly and organized, Amazon has its own system: the Amazon Standard Identification Number (ASIN). Product detail pages (or ASIN pages) are prime real estate for advertisers. Placing an ad directly on the product page of your competitor is a great way to steal market share and increase your sales. 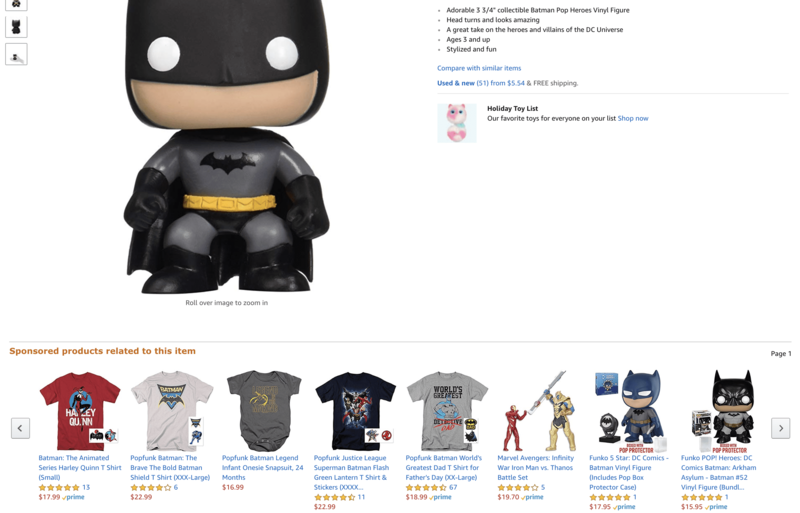 Thanks to changes that went into effect in early November with the release of product ASIN targeting capabilities on Amazon Advertising, this is now more possible than ever before. Amazon accounted for 47% of online retail in the US according to recent compilations. 51% of sales come from third-party merchants. And that’s growing. This means Amazon can be considered as the biggest selling channel for products. It’s important to note that ads have always appeared on product detail pages, but they were targeted based on users' search behavior instead of the ASIN or other factors. That meant when someone searched for men’s basketball shoes and clicked on a pair of shoes, they saw ads for related products such as other shoes or other types of men’s athletic apparel. Now, it’s possible to target that specific men’s basketball shoe ASIN just like you can target a keyword, which greatly expands the possibilities and strategies that can be used. The best way to understand how ad platforms work, especially after undergoing changes, is to do extensive hands-on testing. Our Amazon Advertising agency does this for our clients in order to explore exactly how ASIN targeting works and how effective it can be for them. We devised a strategy to test where we convert best, how the cost per click (CPC) compares to existing targeting options and how much scale is available. We began by identifying the ASIN we wanted to advertise, along with lists of competing, complementary and similar ASINs we wanted to target. 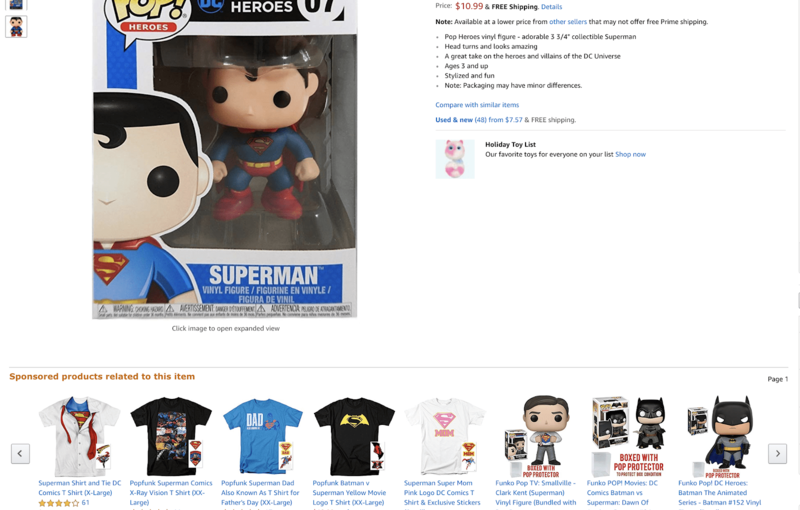 Here, we were able to target a Superman Funko toy with five Superman shirt designs. With a high bid, we were able to show up multiple times and in the prime position in the "sponsored products related to this item" section. 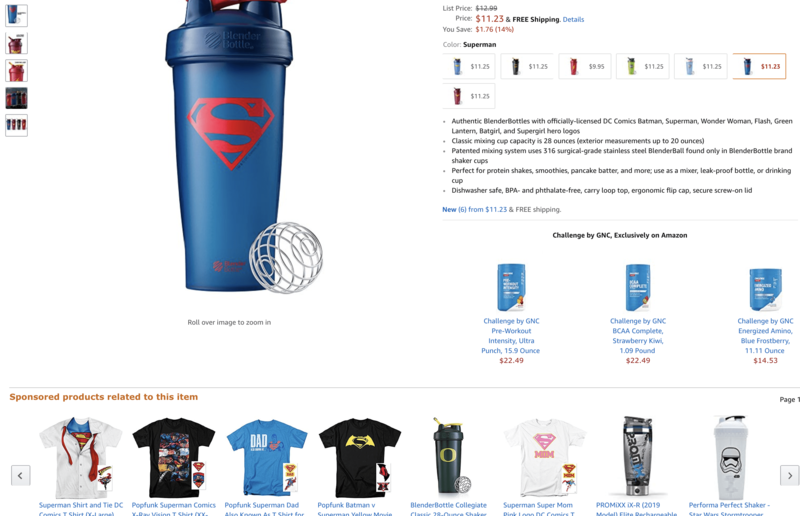 The idea is that someone who wants a Superman toy might also want a Superman T-shirt. In the end, we found that CPC bids for targeting ASINs were comparable to targeting keywords in the same markets. For example, in the pet industry, we found an average CPC of 60 cents for an optimized ASIN targeting campaign and an average CPC of 58 cents for optimized keyword campaigns. Interestingly, we found that targeting ASINs directly led to a higher ad conversion rate: 15% compared to only 6% when targeting keywords directly. As a result of those findings, we created new ASIN targeting campaigns for every product in this seller's catalog. Product ASIN targeting campaigns now make up 40 percent of its overall advertising sales at a lower advertising cost of sale than before. In all of our subsequent testing, we’ve seen mixed results that seem to suggest certain categories will benefit from this new feature more than others. If you’re in an oversaturated market, it might be difficult to get any impressions with this new ad type due to high CPC. But if you’re in a less congested category, scale is easily achievable - and possibly with better performance than keyword targeting. For instance, apparel brands with high SKU-count catalogs can use ASIN targeting ads to turn one clothing purchase into an entire outfit. Another great time to use ASIN targeting is when your product is comparable to another but cheaper. An example we have seen is with a company that sells cleaning supplies. It sells a cleaning solution that is comparable to a well-known brand but costs less. In this case, a company could purchase an ASIN targeting ad and grab the customer's attention at a cheaper price. Targeting complementary goods is also another way to effectively use ASIN targeting ads. For example, if your company sells protein shakes, perhaps you want to target shake-blending bottles or even gym equipment, as there is a good chance that a customer searching for these things might be interested in your product. Before you start the campaign, the first step is to get the lay of the land. You'll need to figure out what keywords you want to show up for. This is Standard Keyword Research 101, except there isn’t a readily available tool like the Google Keyword Planner. Go to Amazon.com, and search the most relevant keyword for your product. Don't overthink it. If you sell dog toys, search "dog toy." Use tools such as Jungle Scout, Viral Launch, or AMZ Suggestion Expander for ideas. Once you're familiar with which keywords you want to target, you can use software to research ASINs. Browser extensions such as Jungle Scout will pull up the top products for keyword searches. Run a few pages of results, and export the results to Excel. Once you have the export of the top products for that search, filter through the data to ensure unrelated products are removed. For example, if you searched "dog toys," there will likely be some listings for cat toys or dog food. Remove any product you don’t want to target directly. You'll be left with a list of ASINs related to your target keyword. 3. Create an ASIN targeting campaign. Using the list of exported and curated ASINs, create a new sponsored product campaign. While setting it up, make sure you select the option to run a manual campaign. Under products, select the product that you want to show in the ad. Next, select "product targeting" under the targeting section. In the product targeting section, click "individual products" and then "enter list." Paste the list of ASINs from your export. If you want to run more searches and add more ASINs, repeat steps one through three before launching new campaigns. If there are specific brands or products you don’t want to target (such as your own brands), enter the brands or products under the "optional: negative product targeting" section. When you're ready, launch the campaign. Product ASIN targeting is only a few months old, which is why only a few advertisers are using it. Soon, this strategy will become commonplace, but marketers have the chance to get ahead of the curve. The longer marketers wait to get good at targeting, the less it delivers in return. So why wait? Trevor George is the founder and CEO of Blue Wheel Media, a digital marketing agency. He is also the president of Trevco, a leading licensing company.